Visitation: Visitation will be 6:00-8:00pm Friday, September 7, 2018 at Anderson Jones Corcoran Harrisburg Funeral Chapel. Service: A memorial service will be held 10:30 am Saturday, September 8, 2018 at Shalom Lutheran Church, Harrisburg, SD. 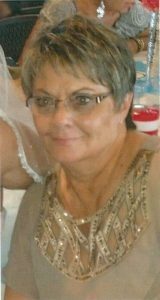 Harrisburg, SD – Beckey Rae Holm, 67, passed away Tuesday, September 4, 2018 at Dougherty Hospice House surrounded by her family. Beckey Rae daughter of William and Mary (Rathburn) Allen was born March 6th, 1951 in Sioux Falls, SD. She grew up on a farm in rural Harrisburg. Beckey graduated from Harrisburg High School class of 1969. She attended Dakota State University in Madison, SD. Beckey was united in marriage with Darrel Holm on December 6th, 1975 in Harrisburg, SD. Beckey worked for Happy Hanks furniture barn, Conlins furniture, Raven Industry, Integra and most recently worked at the Department of Social Services in Sioux Falls; a job she found most rewarding. She was an avid sports fan, watching the Vikings, Augie baseball, the Woodies, and the Harrisburg Tigers. She took great pride in supporting her community and the accomplishments of area athletes. Beckey was a socialite, always planning the next celebration. Family Christmas, birthdays, Halloween or just an impromptu get together; she cherished every minute spent with the ones she loved. One of her favorite places was the family cabin on Big Stone Lake, where she spent many weekends with her family doing sunset pontoon rides and enjoying singing and laughing around a bonfire. Beckey was famous for her party mix, scotcharoo bars and beef stroganoff and she always had coffee on and a stocked beverage fridge. Beckey will be remembered for her big heart, her kindness and her selflessness. She would do anything for anyone, often putting the needs of others above her own. She fought a long, hard battle but never lost her witty personality or her hope. Survivors include her daughters, Amanda (Chad) Allison, Harrisburg SD, Ashley (Jay) Hortness, Canton, SD, three grandchildren, Emma Rae, Mataya Rae, and Jayce William. Sister, Mary Cady, brothers Tom Allen, Doug (Cathy) Allen, Bill (Sheri) Allen, all from Harrisburg, SD. And a host of other family and friends. Beckey was preceded in death by her parents, William and Mary, and her husband, Darrel. In lieu of flowers, memorials may be directed to Avera Prairie Cancer Center. My condolences to the family, I spent several years working very closely with Becky at Raven as well as Bill. Becky was very good at her job which made mine easier. My sympathies to all the family.